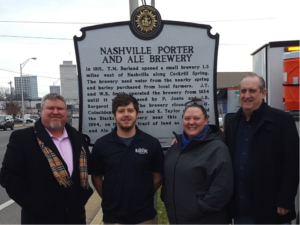 A proposal to relocate the graves of President James K. Polk (1795-1849) and First Lady Sarah Childress Polk (1803-1891), along with the architecturally significant Polk Tomb, from Nashville to Columbia is currently making its way through the Tennessee State Legislature. On March 27, the Senate voted 20-6 in favor of the proposal. The resolution is non-binding, but is a meaningful step in what continues to be a controversial debate. 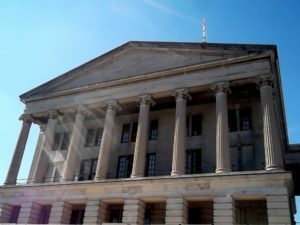 Currently located on the grounds of the Tennessee State Capitol, the 168-year-old Polk Tomb has long raised questions about the sanctity of Presidential sites and graves, as well as about the rights and ownership of public figures’ remains. President James K. Polk died during a cholera outbreak in 1849 at his downtown Nashville mansion, Polk Place, soon after returning home from the White House where he and Sarah had lived for four years. Polk was fifty-three at the time of his death, and had only been retired from the presidency for three months. He was initially buried at Nashville City Cemetery in a temporary grave (because of the infectious nature of his fatal illness) before being reinterred at Polk Place in a Greek Revival tomb designed by renowned architect William Strickland (who also designed the Tennessee State Capitol building, the Second Bank of the United States in Philadelphia, and several other nationally-significant sites). His widow Sarah remained at Polk Place until her death at age eighty-seven, and was buried next to him in 1891. Two years later, after Polk heirs sold the mansion, the State of Tennessee relocated the Polk Tomb and bodies to the State Capitol grounds. In 1900, preservationists lost their battle to save Polk Place and developers demolished it in order to build an apartment building. Today the site is occupied by the historic YWCA building and the Capitol Hotel at 7th Avenue North and Union Street. The debate for Senate Joint Resolution 141 centers around whether it would be more appropriate for the Polks to rest at the James K. Polk Home & Museum in Columbia, the house built in 1816 by Polk’s father and his home for several years. It is the only remaining private residence that Polk ever occupied, and was acquired by the state in 1929. James’s parents are buried at Greenwood Cemetery in Columbia, while Sarah’s are in Murfreesboro. 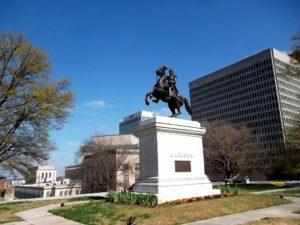 A March 28 Nashville Public Radio story compares the views of a Polk descendent with those of the Columbia museum’s staff, noting that “The Tennessee Senate has approved the moving of Polk’s remains. But the state House, the governor, the Historical Commission and the courts still have to sign off, setting up what’s likely to be yet another protracted debate over where he should finally rest.” Those who support the move often cite the family connection in Columbia, along with the Polk Tomb’s relatively tucked-away position on the Capitol’s northeast corner, along a scenic walkway that also features statues of Andrew Jackson and Andrew Johnson, our other Tennessee presidents. Would the Tomb receive more attention in Columbia? Is that the purpose of this monument? Are the graves of public figures such as presidents meant to function as sites of pilgrimage and veneration, to serve a purpose for future visitors, or simply as memorials to human beings, whose own wishes should be honored? These questions are bigger than just the Polk debate, to be certain. Polk’s will stipulated that he and Sarah be buried at Polk Place, but Polk Place was demolished just nine years after her death. The Capitol grounds may be the next best thing, being both protected from development and located across the street from the Polk Place site. 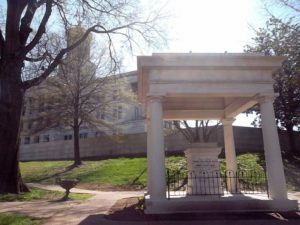 The Polk Tomb is a sacred place and national landmark located within the boundaries of the Tennessee State Capitol, which was added to the National Register of Historic Places in 1970 and designated a National Historic Landmark in 1971. In the opinion of Historic Nashville, the President and First Lady should be left to rest in peace in Nashville, the city they called home.